Police chiefs in Great Britain will discuss arming more of their officers in response to a string of recent terrorist attacks. After a string of terrorist attacks, Great Britain is considering arming its front-line police officers. Unlike the U.S. or even fellow U.K. territory Northern Ireland, police in England and Wales generally don't carry weapons. Less than 5 percent are armed. But attitudes about armed police appear to be changing. While a 2006 survey found 82 percent of police in Great Britain didn't want officers to be armed, a more recent survey of London's police force found just over half said they would carry a gun if asked. 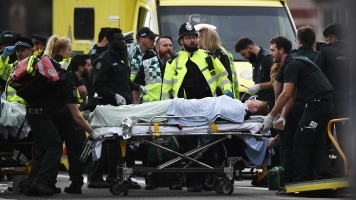 England has seen several recent terror attacks, including one in which an attacker stabbed and killed an officer guarding Parliament. Even if the police want more firearms, it would be difficult and costly to purchase and distribute the guns and train police to use them. A spokesperson for the U.K.'s National Police Chiefs’ Council, which will make the final decision on if officers should have firearms, said: "These are early stage discussions, not yet at a phase of formal proposals."